Mark your calendars for Saturday September 15 (2018) for a hour or so of weeding, planting, and trash pickup at the DePave Garden. Meet at 3:00 pm at the garden (corner of Kenilworth and Britannia). Dress for mess, wear gloves, closed-toe shoes, and bring tools. Roses! The quintessential beauty of the garden. We love them, but sometimes we struggle with them. But they don’t have to be difficult or finicky. 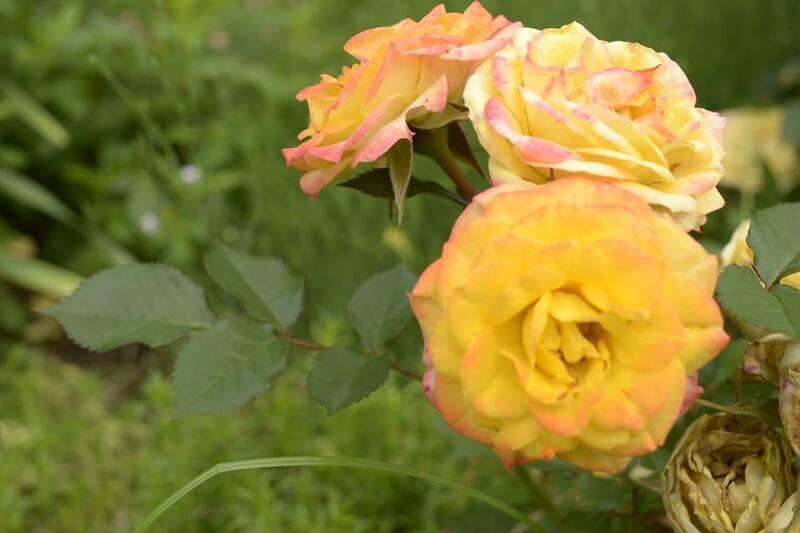 Learn how to choose, site, plant, and care for roses. Good choices and improved knowledge will result in a long-lived, robust and, of course, gorgeous display in your garden. On Wednesday November 22 our special guest speaker is Elizabeth Schleicher from the Hamilton & Burlington Rose Society. Elizabeth will talk about growing roses. Elizabeth is an accredited judge of horticulture and design. Her passion for roses inspired her to become an accredited Canadian Rose Society rose judge. She is past president of the Canadian Rose Society and her local club, the Hamilton and Burlington Rose Society. Currently Elizabeth is Flower Show chair for Burlington Horticultural Society and Secretary for Garden Clubs of Ontario, Judges’ Council. She also is an active member in numerous other societies. In her free time she enjoys the hobbies of photography, gardening, travel and jewellery crafts. All are welcome to attend this presentation. There is no charge but there will be a donation box at the door if you’d like to support the work of the club. Our next meeting features a special guest speaker and a topic that vexes so many gardeners. Claudette Sims, President of the Master Gardeners of Ontario and area resident, presents “Attack of the Invasive Plants: Identify, Counter-Attack and Eliminate”. Her talk will be followed by the regular meeting of the Crown Point Garden Club. Everyone is welcome to attend one or both– come for the educational first half and stay for the action-packed second half. The event is on Wednesday October 25 at 7:00 p.m. The location is the L.O.S.T. storefront at 148 Ottawa Street, right across the street from our usual meeting spot. The L.O.S.T. organization has a lovely renovated space that is used for yoga classes and this will be their first time hosting a public event. We are glad they’ve offered their space to us. Visit their web site at www.wearelost.org. Claudette Sims is a retired educator and has been a member of Halton Region Master Gardeners since 2004. After serving as coordinator of her group, she was proud to continue working as Zone 5 Director and is presently president of Master Gardeners of Ontario. She loves to attract wildlife to her garden and has increasing knowledge and admiration for our beautiful native plants. Her “Fifty Shades of Shade” blog posts support her appearances on local Cable TV. Other interests include travelling, line dancing, singing, ukulele and most recently trying to learn to play the harmonica. We are under attack from alien species, but they’re not from outer space. Learn how to counterattack and save your part of the planet. What’s an invasive plant? How’d it get here? How do I get rid of it? The best reason to NOT miss the April meeting (on Wednesday the 26th) is the peer coaching topic: “shade plants” presented by Gerry Cragg and his crew from the RBG Auxiliary. Club member and Crown Point resident Jerry was team leader for the dedicated group of volunteers who propagated shade-tolerant plants for the RBG’s annual plant sale. The plant sale no longer happens (it’s morphed into the “Plant Faire” see link below) but Gerry and the shade gang have stayed in contact. They will be joining us to share, via powerpoint and discussion, their knowledge about plants that grow best in low light. The meeting starts at 7:00 p.m. at 151 Ottawa Street North (the L.G. Wallace Funeral Home building, in the second floor lounge). Saturday March 4 will be our first road trip of the season! The Stratford Garden Festival is a truly excellent event with great speakers, a ton of vendors, and all supporting the Lung Association. For details about the program and vendors, visit https://www.on.lung.ca/stratfordgardenfestival. We’ll be car-pooling. Departure time is 9 a.m. sharp so please arrive early so we can arrange passengers/drivers. The meeting spot is the parking lot at the back of the Perkins Center, 1429 Main St. East, just east of Kenilworth on the north side. You must RSVP– we are arranging a group discount and we need to know how many are in the group. Please confirm by sending an email to: crownpointgardens@gmail.com. If we have 12 people signed up, the ticket price will be $7. If less than 12, the ticket price is $9. In either case it is payable at the door. The return time is flexible. Some people may want to stay until 2:30 in order to catch Sean James’ presentation on flowers for bees and butterflies. In partnership with Hamilton’s Pollinator Paradise Project we’ve scheduled the 2017 winter sowing workshop. It’s a hands-on, open-to-the-public event on Wednesday Feb. 8 at 7:00 p.m. at Evergreen’s Collaboration Station at 294 James St. North, just south of Barton on the east side of James. Parking is on the street. The Evergreen space is just right– big, with lots of big tables to work on. The event is free but pre-registration is required, through EventBrite. Please register EARLY– the space is big but it is possible that we’ll need to cut off registrations if there’s a huge response. Remember to dress for mess. Bring seeds for swapping/sharing if you have extras. Although the event is free we’ll be requesting donations to the Pollinators Paradise Project (PPP), our organizing partner on this workshop. PPP is behind so much of the work being doing in Hamilton for pollinator awareness and habitat creation. plants getting ready to spread holiday cheer. Plectranthus, Coleus, Hibiscus acetosella, and more! The Garden Club has accepted Delta United Church’s kind offer of a table at their second annual “Get Your Shopping Done” craft and vendor sale on Saturday December 3. Doors open at 9:30 a.m. and the event runs until 2:00 p.m. $2 admission includes your door prize ticket! More than 40 vendors, direct sales, and many craft and one-of-a-kind artisans will be there. There will be everything you need to finish (or start!) your Christmas shopping! A large bake table and lunch items will also be available for purchase. Our new photo / promo display! PLANTS! We’ve taken cuttings of our best and favourite plants for you to keep as permanent houseplants or save for your summer garden as fillers for containers and those annoying bare spaces after the spring bulbs fade. Several varieties of Coleus, two varieties of Plectranthus, Hibiscus acetosella (the “Instant Maple Tree”), spider plants, and more surprises. All nicely potted in sterile mix. Seed-starting mini-trays and mix. We have super-fine Premier PGX seeding mix, a peat and vermiculite based medium for seed starting. If you’ve had trouble starting seeds indoors, this could be the solution to seedling success in 2017. Sold in home-gardener sized bags. This is not available at retail, so give it a try. The back row saved this one. On Wed. Aug. 17 we joined the Flamborough Horticultural Society and friends on a guided tour of Wm. Dam Seeds in Flamborough. The rain DID catch us but no one minded– after this summer’s terrible drought we gardeners were happy to see a nice gentle drizzle. The display gardens had not been irrigated since mid-June (vegetable fields were given priority) so the plants were not as tall or robust as they normally would be. Still, there were many interesting varieties and we got to taste some fresh-picked tomatoes.